We haven’t been posting much recently. 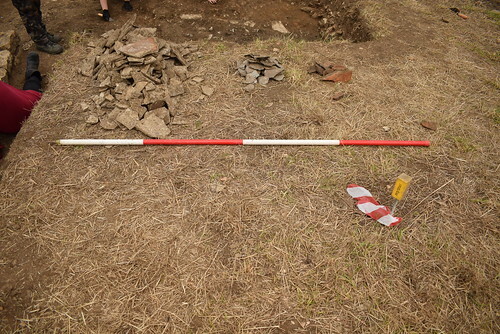 This is mainly because we are in the final stages or preparing the post-excavation assessment. Most of it is written but some unavoidable delays have slowed the production of the plans. We hope the report will be finished this year! 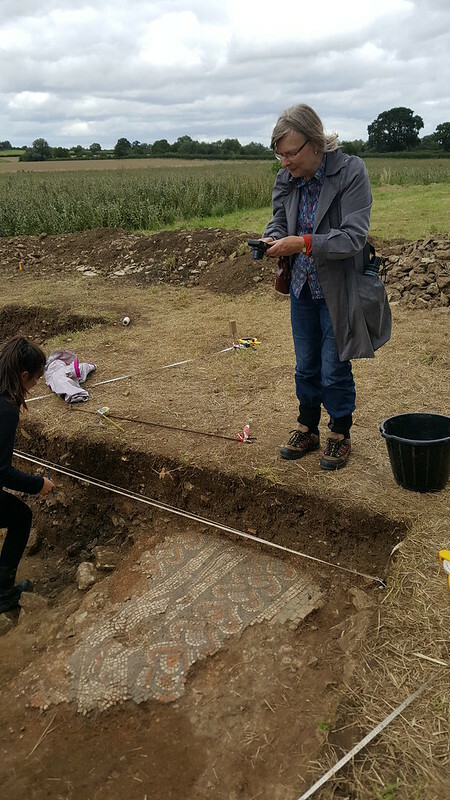 In other news Patricia Witts who visited the excavations in 2017 has just had her paper ‘A new angle on the Lufton mosaics’ published in Mosaic: the journal of ASPROM. It’s a fascinating study of the pavements from Lufton and includes her up-to-date discussion of the fish mosaic around the bath. 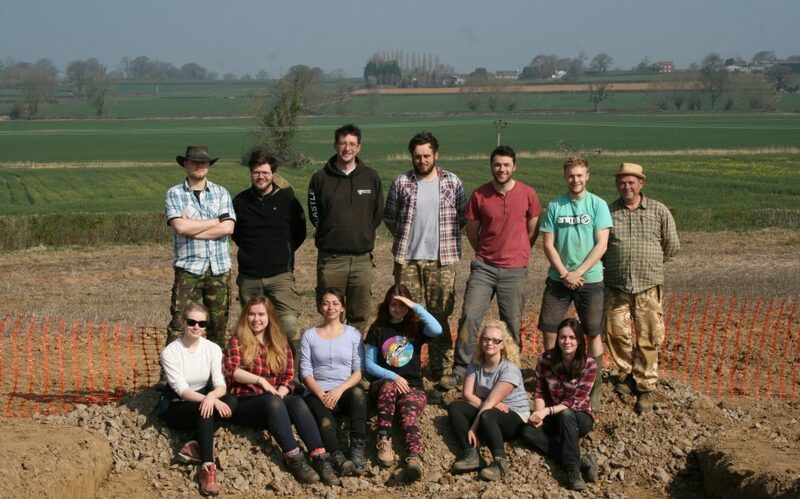 We hope that this year will see some more geophysics undertaken in the fields around Lufton by our friends over in SSARG. We’ve a few interesting locations to work on and if this work goes ahead we’ll try and keep you posted. This post is being written from the farm on a stormy Wednesday. We’re rained off (again) – clearly the weather gods are restoring the balance for previous seasons when we had no rain at all. Yesterday was a busy day in lots of ways. 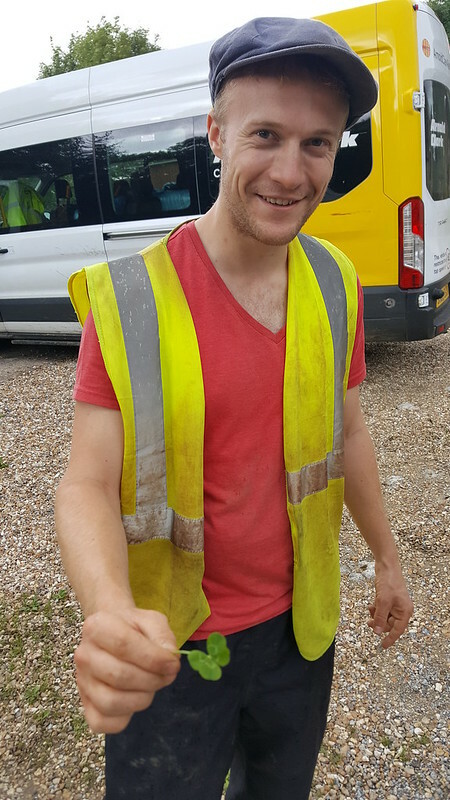 James started early with a radio interview for BBC Somerset at 7.50am, he and Andy then did a run to Asda to pick up supplies for the end of the excavation. We started on site at 10am. 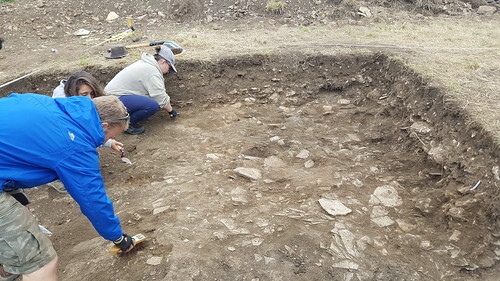 Most of the day was involved in recording and excavating the deposits that lie outside of the building and between two of its buttresses. The sequence between the buttresses is very interesting. When we first exposed the rubble in this area we weren’t sure whether it was backfill from Hayward’s excavation or in situ Roman deposits. What we have excavated is surely the latter. The uppermost layer was largely Yeovil Stone rubble of a small size. This is probably from the robing and collapse of the structure. Under this was a layer of smashed lias and also slate roofing tile. This shows that the building shed its roof before it collapsed or was demolished. The earliest deposit, below the roof tiles, contains a lot of Roman pottery and also animal bones. This seems to be rubbish dumped around the back of the bath house. Annetta, Charlie, Chris, James I and Josh all had a hand in excavating these deposits. 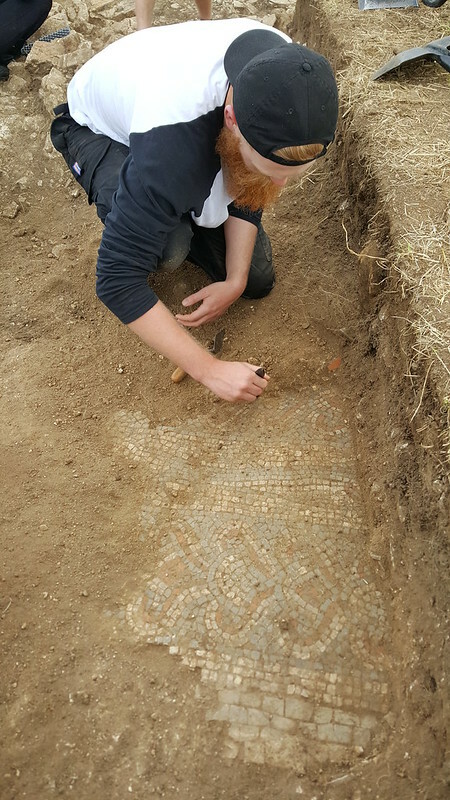 Dan spent most of the day gently cleaning the mosaic with a sponge and water and Antonia was cleaning up the buttress. 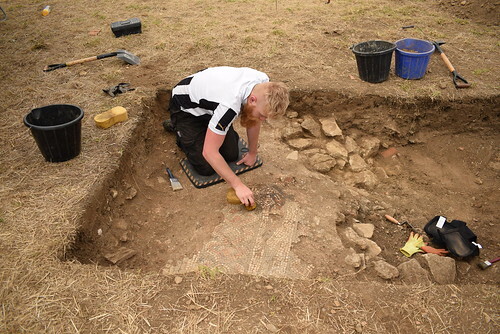 Andy enjoyed himself excavating the joint between the buttress and the robbed out external wall of the octagonal room. At 4pm we hosted our open evening, which was well attended (although not on the scale of last year’s crowd). The Yeovil Archaeological and Local History Society turned out in force and so did many members of the public (some of whom have been reading this blog). It was great to see such interest in our work by the local community. At 7pm, tired from the day’s travails we packed up and headed to Palmer’s Fish and Chips where James bought the team (you guessed it!) fish and chips in celebration of his promotion to Senior Lecturer. 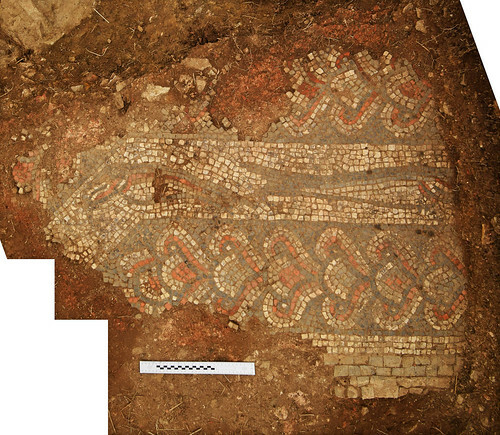 The excavations will be open to the public on Tuesday from 4pm until 7pm. Access is via the footpath from Thorne Lane. We hope to meet some of you at these events. On Sunday we took the decision to extend our extension. 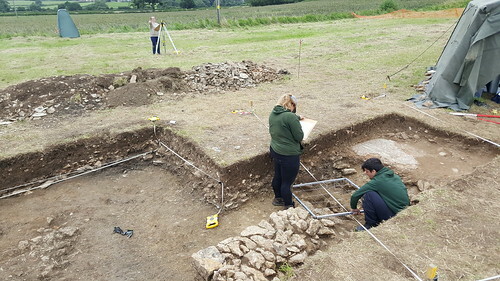 This is on the assumption that the wall we have in the SW corner of our trench is one of the buttresses supporting northern wall of the bath house. Dan, James I and Chris laboured hard to open this new extension. The downside is we are now excavating the entirety to the area allowed to us under by Historic England. In other developments Meg and James P spent the day drawing the rubble spread. We were visited in the afternoon by Dr Kevin Hayward of Reading University and also Prof Roger Leech of Southampton University.